Learn to FLY: Handstands! Tips, Techniques & Home Practice Sequencing to help you get upside down! Booking essential as a smaller group practice! 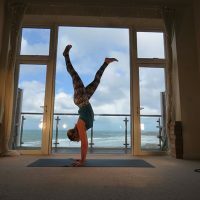 A 2.5hr handstand masterclass with Jen to explore different ways of coming into handstand and learn how your home practice can be the catalyst to achieve this ultimate inversion! Our HANDSTAND special ‘Learn to FLY!’ workshop-style class will look how to find a strong base on your hands and different ways of approaching a handstand safely through tuck, scissor, straddle & pike positions. We’ll examine the body alignments needed to get into the pose and what’s needed to hold ourselves up there. Our home practice can be the best arena to develop the strength, stamina and consistent patterning needed to achieve a handstand with confidence so we will be sharing our own tried & tested inversion home practice in the session with a video for you to follow at home after the workshop. This class is suitable to those that have an existing vinyasa practice. You do not already need to be able to do handstands & headstands but come with an adventurous attitude to giving things a try!